Liquid Magnesium will assist your body to function healthily & improve mobility. 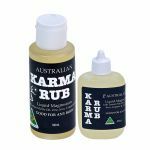 Why is Karma Rub better than magnesium tablets or powders? You apply Karma Rub directly where it is needed most on your body - your back, your foot/feet, your neck, shoulders, knees, Hips....bascially all over! . The skin absorbs 90% of magnesium and minerals when applied topically in comparison to the mere 30% your stomach can absorb when taken orally. KR is therefore more efficient. There are no other man made chemicals in KR - unlike tablets and powders - therefore there are no nasty side effects. 100% natural. KR's magnesium content is via Magnesium Chloride and magnesium sulphate. The form of magnesium that is not harmful to the body and the form that the body requires to function. What can you expect from Karma Rub? 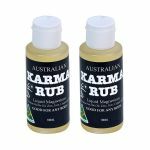 Karma Rub is 100% organic, it is naturally vegan. The body readily absorbs the product through the skin within a couple of minutes. Smearing it directly onto the desired area may assist in all of the above whilst increasing your body's vital minerals naturally. 2 X 100ml Bottles -ON SALE NOW!! *Disclaimer: Results may vary from person to person. 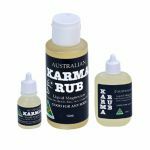 Karma Rub Liquid Magnesium does not suggest to cure an individual's physical, medical or psychological health. For maximum benefits, it should be used in conjunction with a healthy lifestyle.